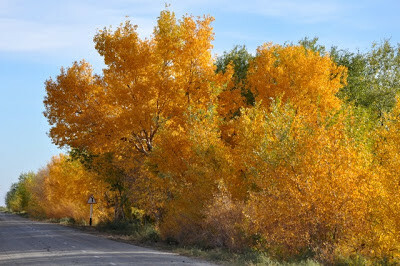 Autumn is especially lovely in Uzbekistan. Not only are the poplars and fruit trees golden, it is harvest time: the fruit is bountiful and the vegetables delicious. The sky is the same astonishing blue, though perhaps a little paler. The days milder and the evenings fresh. Even the road leading to the Ayaz Kala yurt camp is lined in autumnal splendour, while just one kilometre away the yurts stand in the desert's red sands. 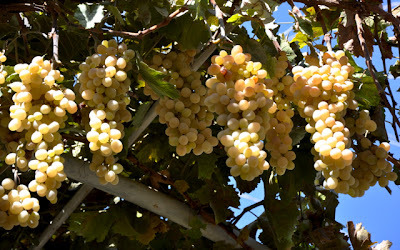 The grapes in the Ferghana Valley are plump and sweet. The markets throughout the country are stacked high with succulent melons, persimmons, plums, figs, pomegranates and peaches. Strangers, enraptured by the taste of white melon, will offer you a slice as you walk by. Autumn is also the time of the cotton harvest: Uzbekistan is the world's second-largest cotton exporter and fifth largest producer. Cotton is hand picked and the fields are full of villagers picking Uzbek 'white gold'. For city dwellers, autumn is when theatres and concert halls re-open after the intense summer heat. Museums change their exhibtions. 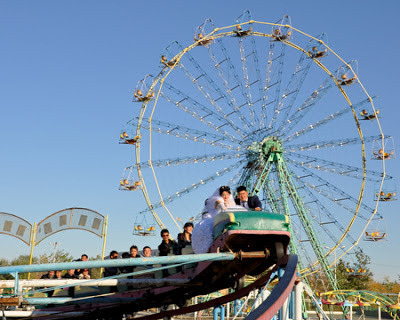 Tashkent, Samarkand and Ferghana parks are draped in gold: families picnic and play by the canals. Tashkent's Botanical Garden, now a little unkempt, is a riot of reds and yellows. It is also a popular season for weddings. Very young women (usually around 20 years) and men (around 22 years), dressed in finery, parade around the towns with family and friends, visiting shrines, monuments and places of interest for countless photo sessions. Uzbek Journeys has just added an extra autumn tour to Uzbekistan from 30 September - 15 October 2013 and a range of new tours to the Ferghana Valley. Why not consider joining?